Made these last night for my Armenian husband...totally opening myself up for complete rejection...hubby took the first bite and said "OMG! These are just like my moms! If this is special diet food for the baby, we can eat this every night!" Your comment made my day, Becky! I'm so glad you like the recipe. I haven't made it in a while ... thinking I need to soon! 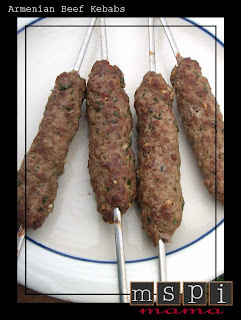 My husband has spent considerable time in Turkey so I made this last night, however I didn't have skewers so I just rolled them into meatball shapes and placed them on a baking sheet to bake for 20-30 minutes at 350°. They were excellent and even my 20-month old daughter ate 2 of them (she usually won't touch meat!). Great recipe and super easy too!